Perhaps our baby bird is a rare one, but she absolutely adores eggplant. She gobbles down the soft roasted vegetable faster than I can cut it for her. But she loves it best made into a garlicky baba ganoush. I’ve found that the easiest way to prepare eggplant is to stab it once or twice with a fork and stick it whole in a hot oven for an hour. If you don’t puncture the skin, steam within the eggplant may cause it to explode in your oven. (Yes, it can really happen.) Roasting–or grilling–whole, there is no need to cut or salt it to reduce bitterness, or to use oil in order to make the flesh tender. The eggplant is done when it gets soft and easily can be mushed in. After cooling, it looks wrinkly and is easy to peel. One more reason why I love this preparation is that it becomes easy to separate the tentacles of flesh from the seed pods with your hands. I personally prefer not to eat the seeds. 1. Preheat oven to 400°F. 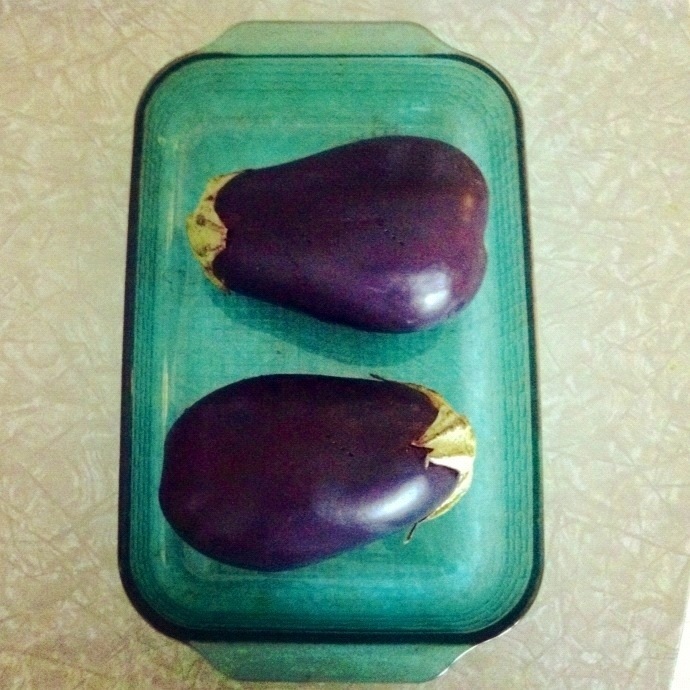 Place eggplant in a baking dish. Pierce the skin of each eggplant with a fork or knife. Bake for about 1 hour, until the skin is easily indented and the flesh feels mushy. Allow to cool. Once cool enough to handle, peel and discard the peel, stem and seeds. (Eggplant can then be stored for later use. 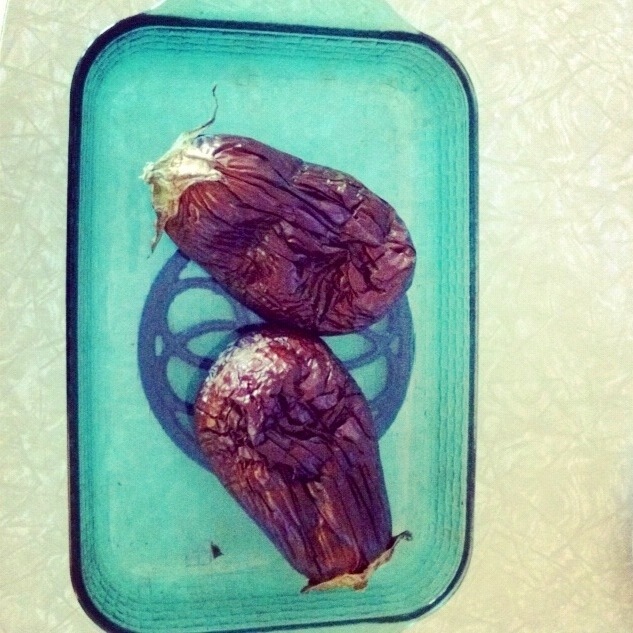 Try roasting an extra eggplant for baby food or other recipes.) Reserve any liquid with the flesh. 2. Put eggplant flesh and liquid, tahini, olive oil, garlic, lemon juice, salt, pepper, smoked paprika, cumin and sesame seeds in a blender. Note: quantities are all suggestions. Blend until smooth. If the blender struggles, try adding more oil or liquid. Taste and adjust the ingredients to your liking. 3. (Optional) Garnish with a sprinkle of paprika, zatar, fresh pomegranate seeds and/or a drizzle of olive oil. 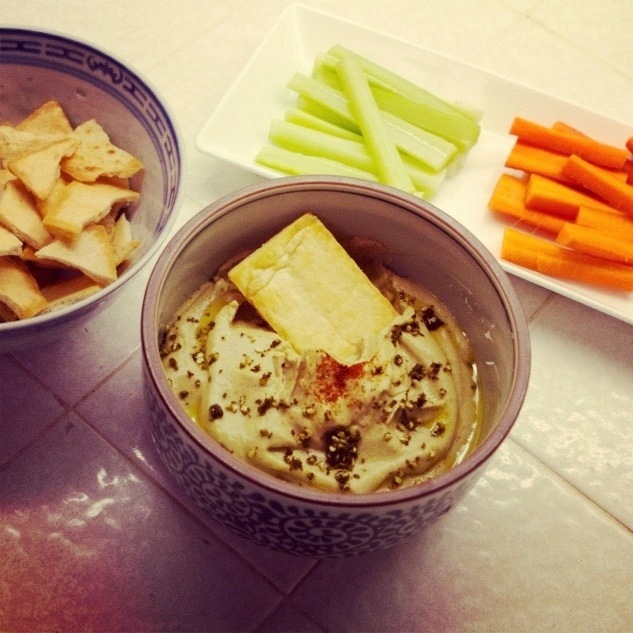 Serve with pita chips, pita wedges or crudites (aka veggies). Also great in pita sandwiches. Our baby has loved this as a puree starting at 9-10 months. Before that I pureed the roast eggplant with other vegetables, starting at 8 months. Small cut bites of soft roasted eggplant make excellent finger foods for baby led weaning. She also likes baba ganoush mixed with rice, either eating it with her hands or practicing her spoon skills. Our baby has never had any digestive issues from eggplant, but her skin does turn red when she applies baba ganoush topically, perhaps from the eggplant, but definitely from the lemon juice and garlic, too. She loves to rub her food into her face and hair, so I try to keep it out of her eyes.